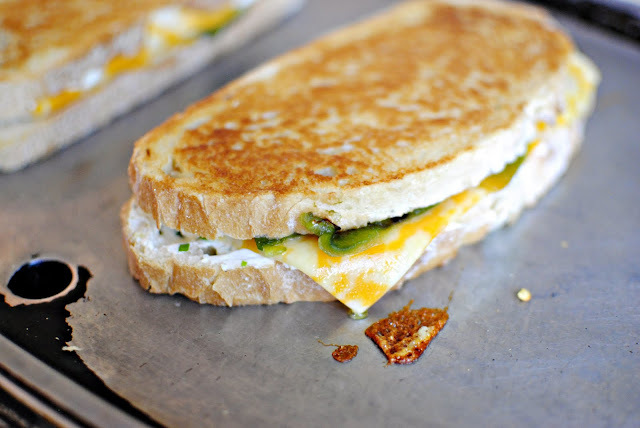 Now here is a delicious sandwich, meet the Jalapeño Popper Grilled Cheese. And my friends you’re gonna love this one! It came to me after watching Guy Fieri in Diners, Drive-ins and Dives. Is it me? Or, does all that grilled, fried and smoked food get anyone else extremely hungry while watching the show? I think it’s pure strategy… because why would the Food Network air that show late at night! So do ya remember the other day when I posted that I would choose pizza as the one thing I could eat for the rest of my life? Well maybe it wasn’t all-out lie; I just think I temporarily forgot about my love affair with all things grilled cheese! And I can proudly say that I make a mean grilled cheese! Can a grilled cheese be mean? Why yes it can! And that’s exactly what I have here for you… One. Mean. Sammie. I know your thinking ‘She just posted a grilled sandwich recipe just a few weeks ago”…. but this isn’t your typical grilled sandwich. It’s a jalapeno popper… but in grilled cheese form. And I just couldn’t wait to share it!Oh heck yeah. Start by placing a few jalapeno’s on a hot grill. Depending on the size of your bread, I would say about two peppers per sandwich. Next, roast them until the skin is charred, about 10-15 minutes. 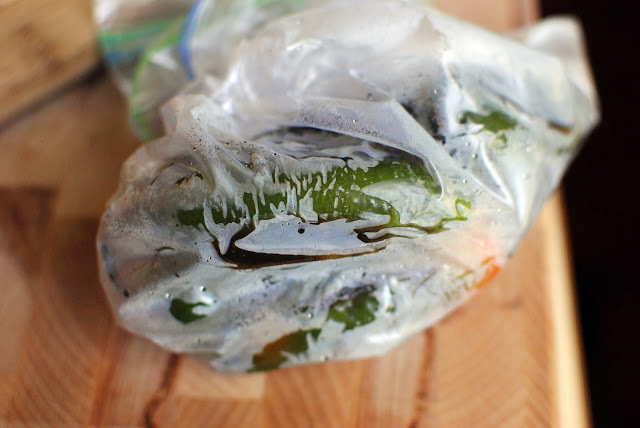 Then place the peppers in a bag (paper preferred, but I was all out) or a bowl covered tightly with plastic wrap. Let them steam for about 10 minutes. 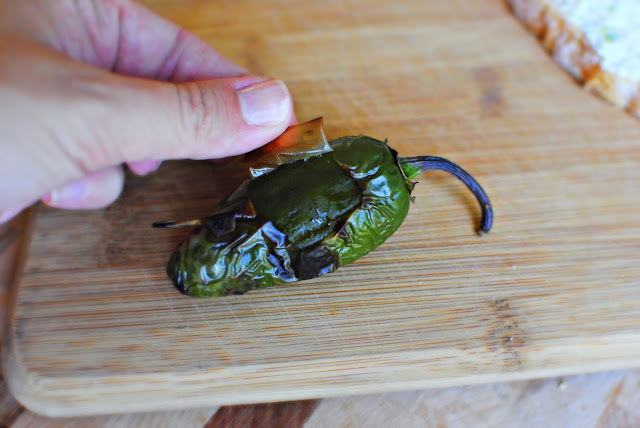 Doing so aids in easy jalapeno skin removal. Bonus. 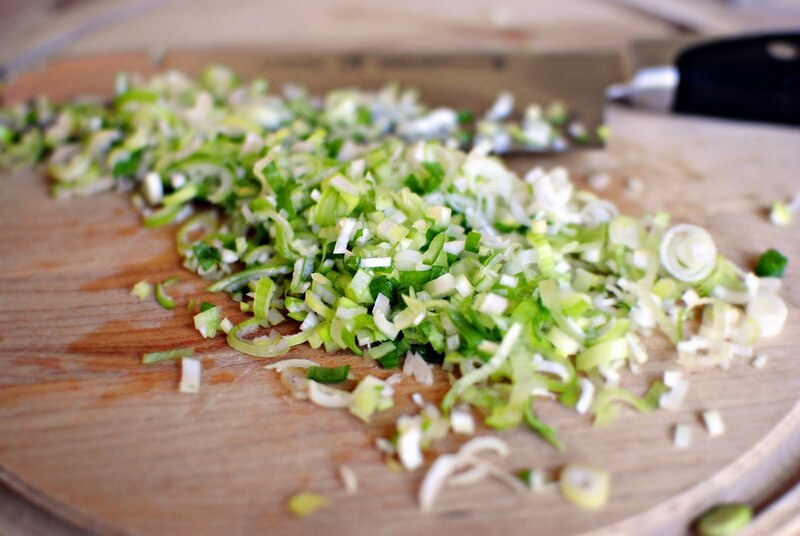 Meanwhile mince up a few green onions… like 4 to 5. Then add them to a bowl along with some black pepper. 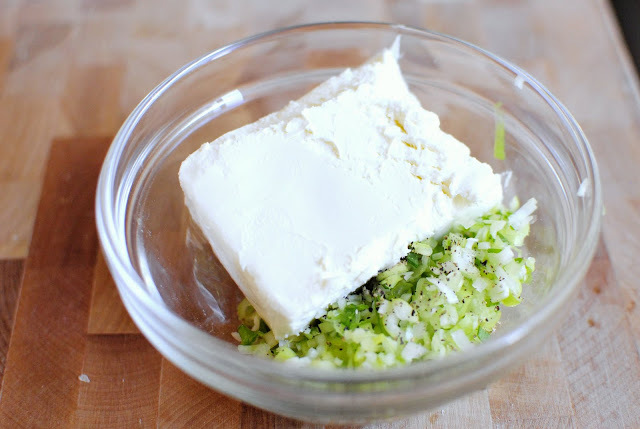 Next, throw in a few ounces of, my favorite, cream cheese! And then mix it up until smooth. 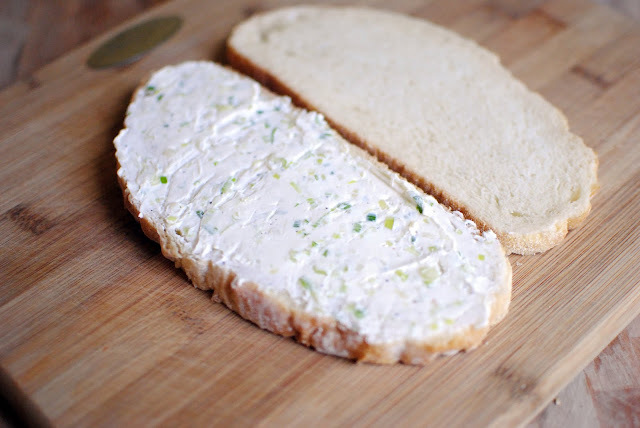 Next, take two slices of your favorite bread. I like to use sour dough, but it really doesn’t matter, just as long as you smear it with as much of the cream cheese mixture as you’d like! Then lay out two slices of cheddar or colby jack cheese. 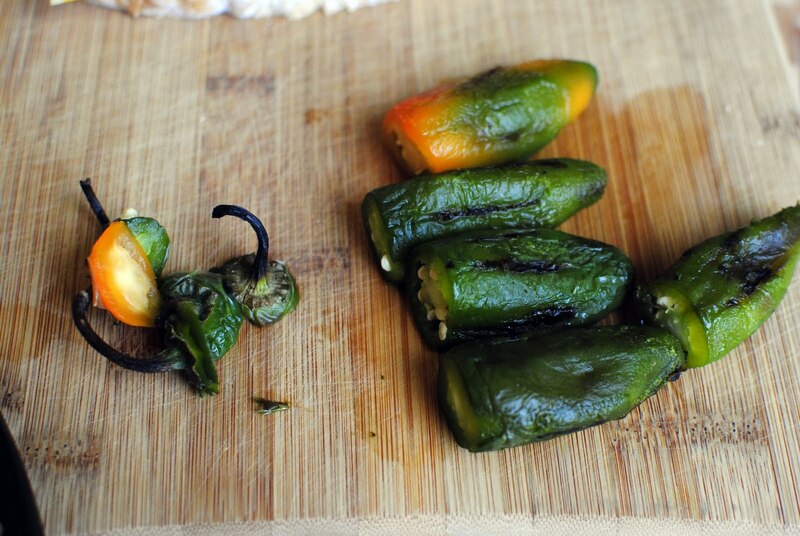 Once the charred jalapenos have steamed and cooled a bit in the bag, gently peel the skin away from the pepper. Remove the tops and discard. 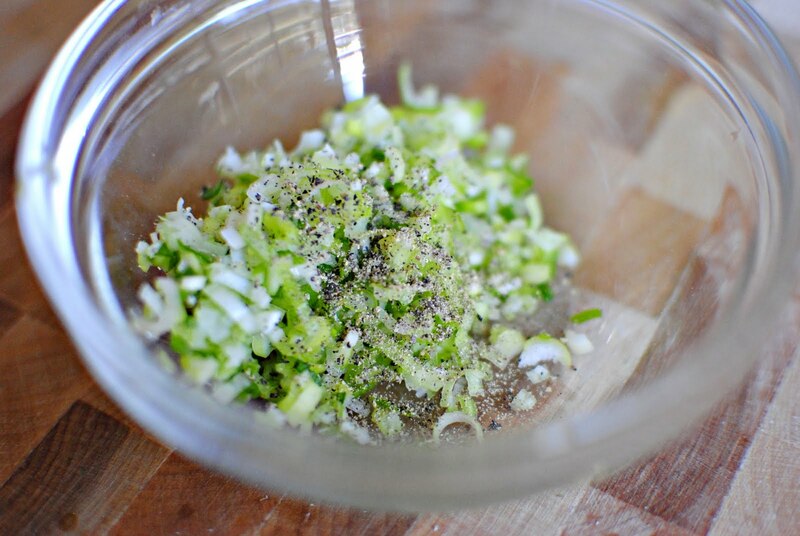 Slice down one side of the pepper and remove the seeds and ribs… be careful it only takes one slip of the knife and you hit a juice pocket that sends a small droplet of fiery acid onto your left eyeball which will leave you partially blind for about 45 seconds. True story. Ask Pat… he was laughing the whole time. Cruel… so CRUEL! So I gave him 3 peppers and left some of the seed in. Normally I’d use just two… but I thought he should could handle it… just like I handled the assault to my eye ball. Then top with the other slice and butter the one side. Next place the sandwich on a preheated 375° griddle (butter side down) and sear until golden, don’t forget to butter the top slice! Next, flip and sear on the other side until golden and crispy. Remove from the griddle, slice in half and serve with a beer and some kettle chip. Or a glass of milk as these can be a bit spicy. 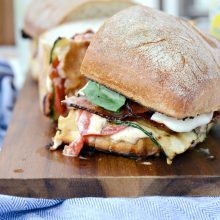 My hubby LOVED this sandwich, and so did I! I’m not sure what if I loved more the mildly spicy peppers, the gooey cheese or the crispy bread! You decide and let me know! Enjoy! And if you give this Jalapeno Popper Grilled Cheese recipe a try, let me know by snapping a photo and tagging me on twitter or instagram! Everything we know and love about jalapeño poppers stuffed into one mammoth Jalapeño Popper Grilled Cheese. So spicy and so delicious! 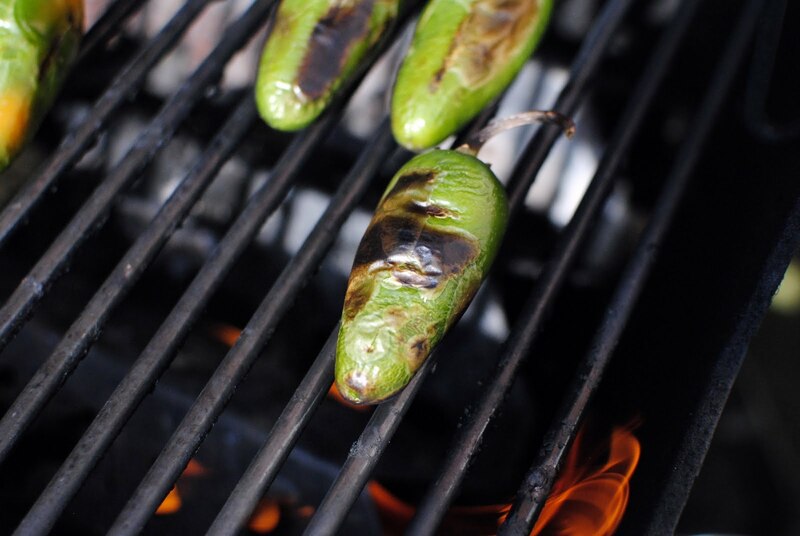 On a hot grill (or in your oven cranked to 450°), char the jalapeños about 10-15 minutes. 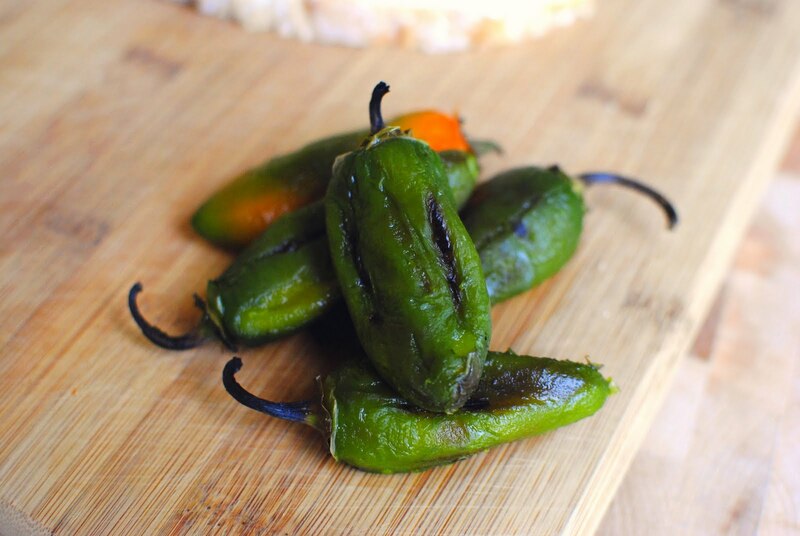 Place charred jalapenos in a bag to steam. After about 10 minutes, gently peel of the skin. Slice off the tops and discard. 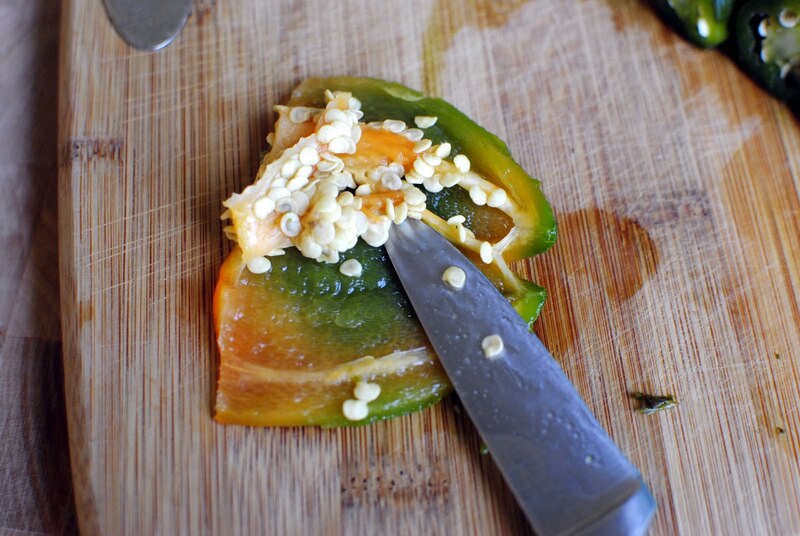 Slice down one side of the pepper and carefully remove the seed and ribs of the pepper. Next combine the cream cheese, minced green onion and black pepper in a small bowl. 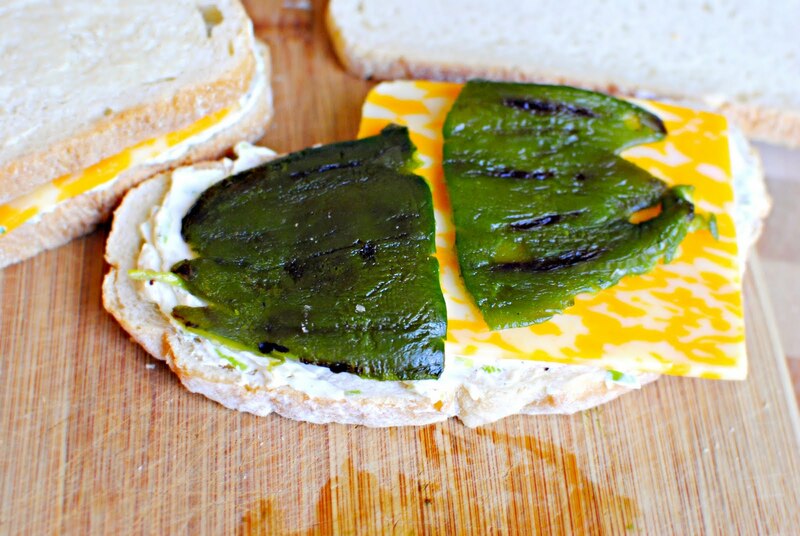 Spread desired amount of cream cheese on one slice of bread then layer jalapeno's and cheese. Butter outer slices and griddle until golden and crispy. * Always wear gloves while handling jalapenos or any spicy peppers. 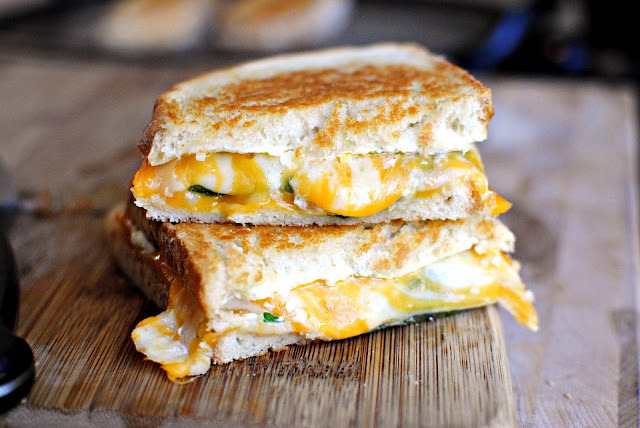 Just when I thought grilled cheese couldn't get any better! Ohhhhhh dang! And I have a basket of these bad boys (jalepenos) sitting on the counter at home! Seriously, I am about to pass out. That is now my new favorite thing. IN LIFE. Dang girl! That looks fantastic! 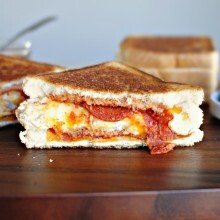 It's 8:00 in the morning and I'm craving this sandwich! You're a genius!! I just had a grilled cheese with banana peppers yesterday and I feel jipped! I love this idea! I don't know what to say to this rigth now other than —- I REQUIRE ONE!!! I want to make this this week. It looks super scrumptious! AHHHHHHHH! Drool. Yup, that looks beyond delicious! I am such a sucker for anything that has a kick to it…I bet this is just simply irresistible. I love your last photo! Allison at Novice Life… make these… and SOON! Terry.. I didn't use gloves this time because I thought.. "hey they aren't raw…" My hand still burned the next morning!! This is truly sent from heaven, what an awesome sandwich! This looks amazing! I can't wait to try it. 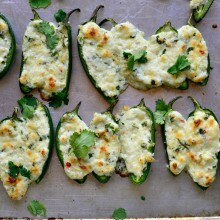 Seriously, jalapeno poppers are awesome. Also, I love Diners, Drive-ins, and Dives. We've gotten some really excellent tips about smoking our own meat from that show. 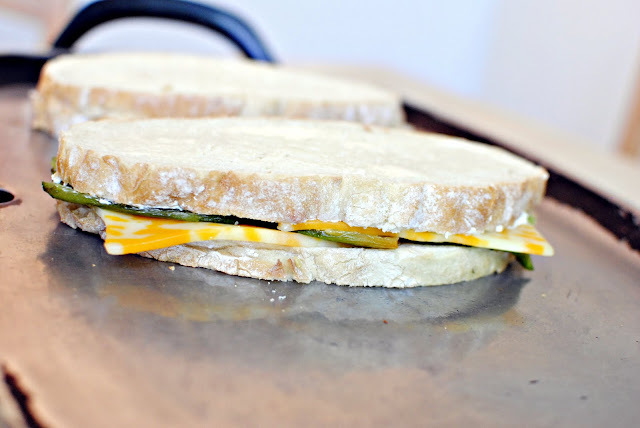 I make a jalapeno popper pizza, but never have thought to turn it into a grilled cheese! Come to momma! Vinny's all-time favorite food is jalapeno poppers (classy right?!? ), so when I saw this post it wasn't "ooh, gotta make that soon," it was "quick! get on your flip flops we gotta run to meijer!" Made it for dinner tonight, and AWESOME!!!! Loved every bite and Vinny is really wanting to hug you! These are going into the permanent rotation! Oh so glad Kellie!! 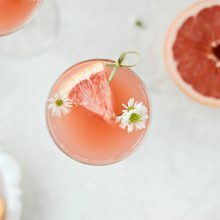 I'm already thinking about making these later in the week! LOVE THEM! I think my husband would love these! He is picky about his grilled cheese, but I think this would exceed his expectations! This looks fantastic! I love the idea! Laurie this is absolutely amazing! This grill cheese isn't mean, its angry and its screaming my name!!! Honestly I am trying this soon! I especially love the cream cheese and green onions too! Asbolutely fabulous!! defintely enter that sandwhich contest!!!! i am new to your blog, i am so happy to have found it. it is beautiful! 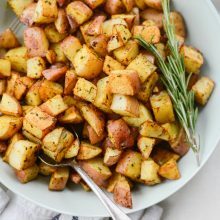 thank you for sharing this lovely recipe with us! yummm…what a great rendition of a grilled cheese! brilliant. I love the spice!!!! and that you mixed two big favorites in one! Oh man this looks good…really, really, good! This pretty much trumps all grilled cheese sandwiches! 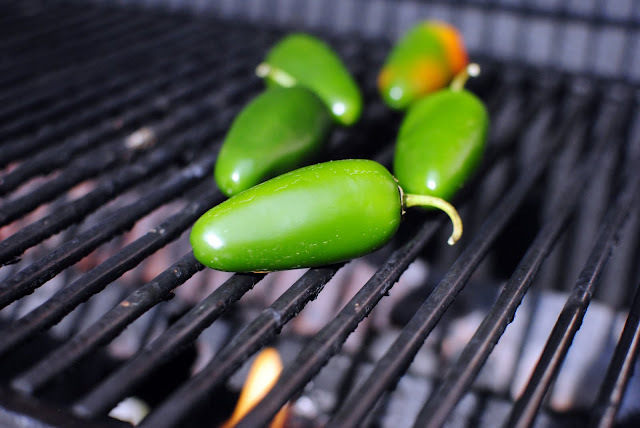 I've been thinking what to do for our backyard jalapenos. Thanks for sharing, I could have as many of it. OMG! 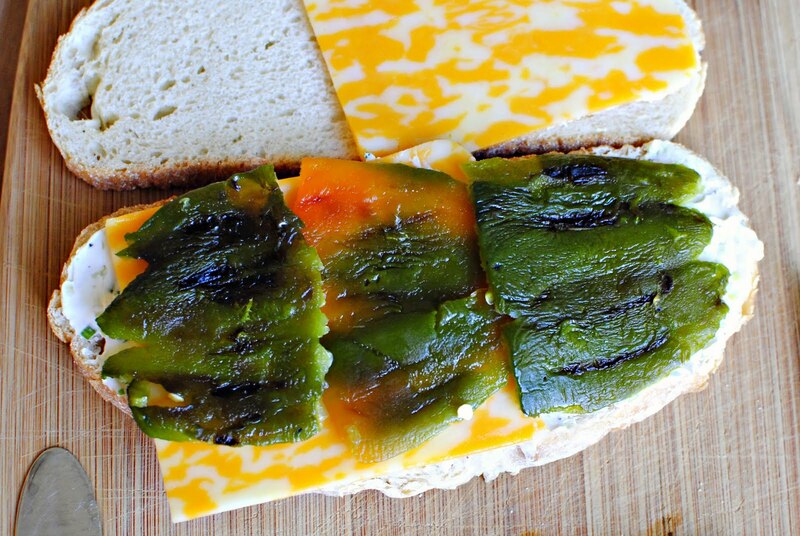 Huge fan of grilled cheese sandwiches but the added jalapeno's is such an amazing idea. I must try this recipe soon! I can't wait to make this for my husband! He's going to LOVE it! Oh my gosh this sandwich looks incredible! I think I know what I'm doing for lunch now. Yum! Thanks for sharing. i just had this sandwich at Melt in Cleveland,OH. they battered and deep-fried theirs, bur they did not roast the peppers. they were just raw. it was stupid yummy! Yummy!! Yummy!! Thanks for sharing, love the photos so detailing. It's almost 10AM and I want this for breakfast. Awesome post with amazing photography. oh my goodness..that is a sandwich that needs to be made in our kitchen…all of our fav ingredients. Great idea thanks for sharing it. Oh wow and just when I thought grilled cheese couldnt get any better!!! This looks FABULOUS. Yum, yum. Good gracious…this looks delicious. This is all I want right now! Spicy grilled cheese? I can't think of many things much better. Love it! Oh, wow. I made these (no fresh Jalapenos here in Russia, so had to use canned one, worked just as well) last night: I made two try'em out. My husband made me make two more right after. One of the few recipes I will be reusing again and again. Words can not describe how delish this was. 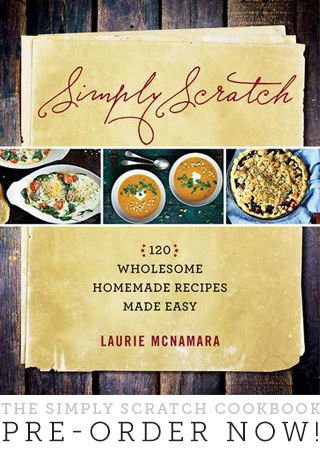 I am trying all of your recipes. Wow-wow-wow-wow!!!! So glad I checked out your top 10. I missed this the first go-round. The hubs and I are fans of Diners, Drive-ins and Dives, too. Always leaves us drooling…as does your blog! Can't wait to try these! I think I'm in LOVE!!! Yum!! Can't wait to give it a try! Looks so yummy!! Can't wait to try. Just had this for dinner. What a delicious grownup grilled cheese! Loved it. These were so good. My husband loved it! Oh, wow, yum. I’d have to make this one for myself, since my kiddo and husband can’t handle the heat! Thanks for the great inspiration. This is ingenious! 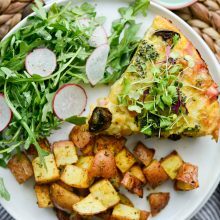 I love spicy food, and I love cheese…Thank you for posting this yummy recipe…the flavors of the roasted pepper & melted cheese….ugh! I pinned this months ago and forgot about it. While cleaning up my boards, it was rediscovered and I had to have one. Immediately. A trip to the store and 40 minutes later, I was biting into the most delicious sandwich I’ve ever tasted. Yup. this was genius. added avocado. best night ever. Made this for lunch today. 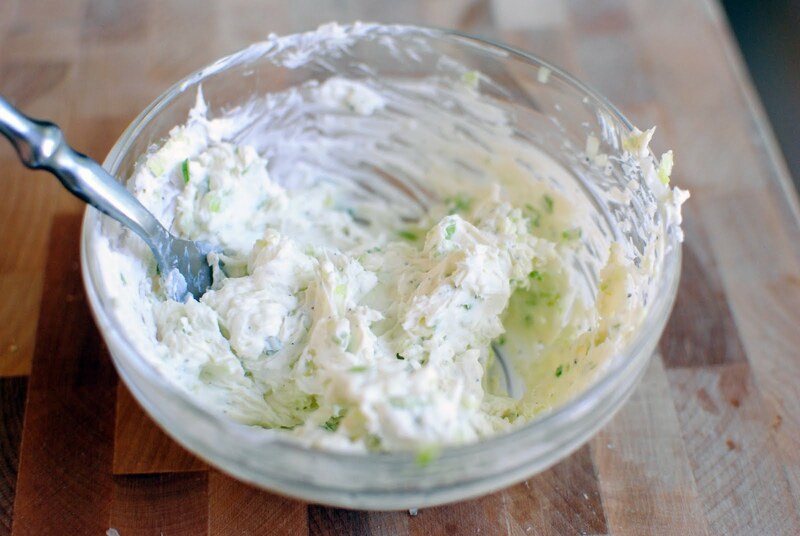 It’s a really great idea, but next time I will not use all the cream cheese that this recipe called for. I found it to be way too much (and I really love cream cheese!). Also, this recipe could definitely benefit from some bacon. 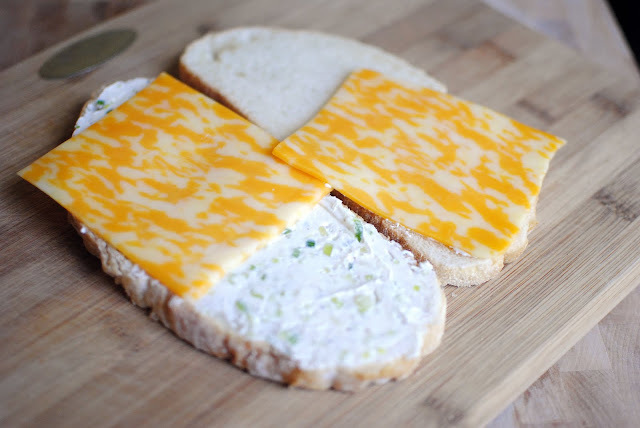 OMG, this looks yumilicious…A perfect recipe for cheese lovers…Will try it soon. Slice down one side of the pepper and carefully remove the seed and ribs of the pepper. Pingback: 28 Grilled Cheeses That Could Be Better Than Your Boyfriend. In Fact, A Lot Better. 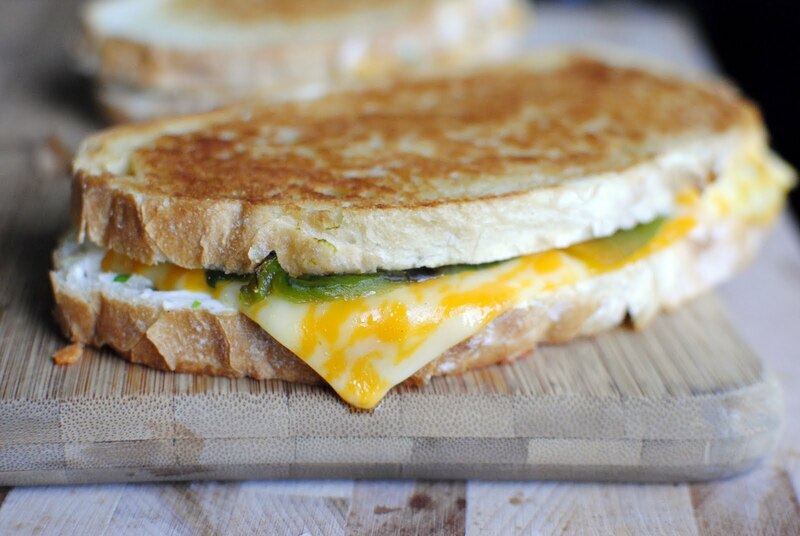 Pingback: Gourmet Recipes For The Grilled Cheese Lover In You….Mouth Watering! Pingback: 31 Grilled Cheeses That Are Better Than A Boyfriend - zdouf!